As women, we know that in order to feel our best, we want to look our best. But that can be a frustrating goal. Between aging, hormones, and the busyness of daily life, keeping your skin and body in top shape is no easy task. That is, it’s wasn’t, but thanks to the aesthetics services at Total Health and Wellness: Center for Personalized Medicine, you can transform your outer beauty into a reflection of your inner radiance. To learn more, call Rosalind Jackson, MD, and her staff at Total Beauty Health & Wellness OBGYN or schedule your appointment at their Miamisburg, Ohio, office online. What kind of facial aesthetics services are available? You want to put your best face forward. And Total Health and Wellness: Center for Personalized Medicine can help. Dr. Roz and her team of aesthetics experts offer a range of services to help you get beautiful, radiant skin. Are you ready to turn back the clock? Whether you’ve got fine lines and wrinkles, sun damage, sagging skin, visible veins, or unwanted hair, Forever Young BBL can help. This innovative light therapy from Sciton® Inc. is designed to target sun damage and other signs of aging, eliminating them so your skin can look its smoothest, clearest, and youngest. 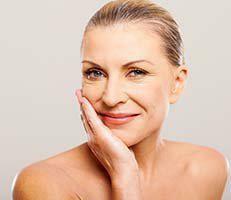 Don’t let wrinkles and fine lines age your face. Dr. Roz offers a wide range of dermal fillers and Botox to help you smooth the lines in your face to look younger and more refreshed instantly. These injectable wrinkle removers take just 15 minutes to apply and deliver dramatic results that will last for months. Use your body’s own healing power to rejuvenate your skin. During platelet-rich plasma (PRP) treatments, Dr. Roz takes a small sample of your blood and then separates out the platelets. These platelets are little powerhouses that trigger healing and growth in your body. When used on your face, they encourage the production of new, smooth, glowing skin. Did you know your most beautiful skin could be waiting just underneath the surface? HydraFacial resurfaces your skin, removing the topmost, least vibrant layer to reveal the new, radiant skin underneath while delivering powerful nourishment and hydration. What kind of body aesthetics services are available? Imagine if a warm, relaxing massage could reduce your cellulite. Thanks to this innovative treatment, it can. ThermiSmooth can be applied regularly over a two-month period to result in the noticeable temporary reduction of cellulite. If you’re looking for a nonsurgical way to reduce body fat, look to CoolSculpting. This noninvasive fat reduction procedure freezes fat cells in stubborn areas, destroying them so you can get your lithest body. What aesthetics services are right for me? Dr. Roz and her staff offer only the best, safest aesthetic treatments available today. If you have certain skin or body goals you want to achieve, they can help you determine which aesthetics treatments will be most effective for you. If you’re ready to get started, call Total Health and Wellness: Center for Personalized Medicine or request a consultation online today.